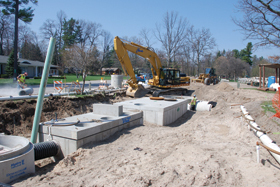 We installed three new antibacterial filters at East Bay Park in spring 2013 to protect swimmers from E. Coli bacteria. You can see photos on Facebook. “The ultimate goal is to remove East Bay Park from Michigan’s Impaired Waters list,” says Sarah U’Ren, Program Director. East Bay is on the state’s Impaired Waters list due to high E. Coli levels. 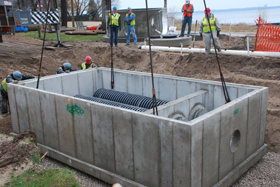 Workers installed three systems; each has an oil and grit separator, sediment filter and antibacterial filter. Runoff first reaches the oil and grit separator from the storm drain system. Swirling causes heavy dirt and grit to fall to the bottom, while lighter items such as oil, grease and trash float on top. Water then flows to the sediment filter. It’s a series of three chambers that further settle out sediment and dirt. There is an additional filter between the second and third chambers that screens out floating materials such as cigarette butts and pine needles. Then water flows to the antibacterial filter. There are filters inside the black tubes that carry a positive charge. Stiff fibers puncture E. Coli bacteria cells, then the electric charge kills the cells. Since the cell is dead, the charge doesn’t get transferred, so the filter is ready to zap the next E. Coli cell it contacts. Water in the filter is not electrified; this happens on a microscropic level. Cleaned water then flows to a basin before it reaches Grand Traverse Bay. The Watershed Center partnered with the City of Traverse City. The Watershed Center received a $768,000 grant from the U.S. Environmental Protection Agency’s Great Lakes Restoration Initiative.